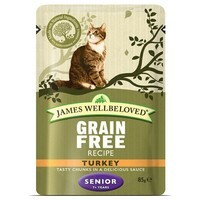 James Wellbeloved Grain Free Senior Cat Wet Food Pouches is a complete wet food that provides unrivalled health benefits to older cats. Full of added vitamins and minerals to ensure your cat gets all the nutrients they require for healthy living, James Wellbeloved Senior Cat Pouches have been made from only the highest quality natural ingredients. Hypo-allergenic, this tasty food is the perfect choice for those older cats that suffer from food intolerances, as it contains only a single meat protein source and contains no cereals, pork, beef, wheat, wheat gluten or dairy products. Great also for cats with digestion and skin sensitivities, this luxuriously tasty food contains no artificial colours, flavours or preservatives! Very well liked by one of our 10-yr-old cats, and a quality product that is British-made and was on offer with VetUK. has a very unpleasant grey appearance, very glutinous, my cat refused to eat this.